When it comes to accidents on the road, there is only so much that you can do. A lot depends on others on the road. While it is always a good idea to ensure safety when driving on the roads, an accident may happen for no fault of yours. That is when you need an experienced attorney to represent your case so that you are not held liable for something that you did not do. You may also be deserving of compensation for physical injuries, mental trauma, loss of income, and maybe even permanent handicap. Alex R. Hernandez Jr. Trial Lawyers PLLC can help you protect your rights and ensure that you are not wronged in any way. 1. In 2016, there were 1.44 fatalities per hundred million vehicle miles traveled on Texas roadways. 2. 3,773 deaths in 2016 were 5.45% more than the 3,578 deaths in the preceding year. 3. In 2016, there were 17,582 cases of serious injuries resulting from 14,202 serious injury crashes. 4. The annual vehicle miles covered in Texas were 261.994 billion; this was a 1.5% increase over the miles covered in the previous year. 5. Deaths from accidents that happened in rural parts of the state accounted for more than 51% of the total fatalities. 6. There were 1,293 deaths from single vehicle accidents in Texas. This figure was 34.27% of the total fatalities. 7. Accident-related fatalities occurred on every single day in the state. 8. 814 people died from crashes occurring at intersections. 638 people died from head-on crashes. 9. The highest number of people, 382, died in the month of October. One crash occurred every 57 seconds and one person died every 140 minutes. 10. 265,076 people were injured in vehicle crashes in 2016. 496 fatalities involved motorcycle riders and pillion. 53% of the motorcyclists were not wearing helmets. 11. Restrained occupants accounted for more deaths than unrestrained ones. 1,284 versus 999. 12. 678 pedestrians lost their lives in 2016. 13. 987 fatalities reported the driver being under the influence of alcohol. The worse time to be sharing a vehicle with a drunk driver was between 2:00 am and 3:00 am. 14. Texas counties with more than 30 fatal crashes in the year included Harris County with 147 crashes; Smith County and Travis County with 32 and 31 such incidents, respectively. 15. 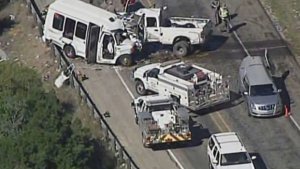 El Paso, Dallas, Corpus Christi, Arlington, Amarillo, and Austin recorded higher numbers of fatalities. The figures were 65, 192, 30, 26, 26, and 80, respectively. 16. The rate of crashes was the highest for 4 or more undivided roads on urban roadways. Urban state highways recorded the highest number of crashes. Rural interstate highways had the lowest number of crashes. 17. Driver inattention, inebriated driver, failure to drive in a single lane, speeding, and mistimed evasive action were among the chief contributors to fatal accidents. Go here for even more detailed statistics on vehicle accidents in Texas.